The other day, I alluded on facebook to knowing a secret…but couldn’t divulge the secret…but today I CAN, actually, divulge the secret – yay! Well, technically it isn’t a secret now, because I’m allowed to say….that’s if you didn’t know already. OH, JUST GET ON WITH IT ANNIE AND TELL US!!! Oh, alright then. Here we go…. Rrrrring….rrring (that’s my mobile, btw…ringing) Well, actually, it has a jingly kind of ring tone, but I’m not clever enough to describe it, so a ‘ring’ will have to do. Me: Whoa there!…No! Absolutely not. No way, Hose. It ain’t happening. Never. EVER!!!! Her: Oh, go on. You’ll be amazeballs. Me: No I won’t. You know I don’t ‘do’ talking. I can’t talk. I’ll get nervous or cry. I’ll pass out or throw up…and sweat profusely…and talk gobbledygook….and just be completely and utterly pants. Her: You won’t! I have every faith in you. More discussion and cajoling followed…. Her: Brilliant! I’ll send you all the details. Bye. Me: Bye. *Holds phone away from head and stares at it, astonished*. WHAT did I just let myself in for?….arghhhhhhh!!!!! But this ‘bla blah’ stuff would all be in aid of an amazing Charity who’ve been a lifeline for us – if you’re new to the blog, Hello! *waves excitedly and a little bit too enthusiastically* – just have a look at one of my posts entitled The Legacy Rainbow House (it should be in the therapy section). That may explain things a little better. It saves me explaining in too much detail here…I do have a tendency to go on a bit. Well, quite a lot actually. So, given it was for the charity, I just had to say yes. And there you have it. That’s how it all started. And here, you will have observed Hannah and I driving into Media City. Me, ashen faced and wide eyed, clutching the steering wheel with sweaty palms. My blood pressure possibly hitting the roof and having had no breakfast for fear of throwing up on a famous person. Famous people often wear expensive clothes. I doubt I could’ve afforded the cleaning bill! So I resorted to hitting the Lucozade….again!…and kept my fingers crossed that I could keep that down and wouldn’t pass out. Well, we went to speak on the radio. OK, well, technically it was me that spoke (given Hannah’s non-verbal) and she just decided to ooze cuteness and did the schmoozing and caused havoc by grabbing anything that she could…like anyone’s drink and really expensive radio equipment *sigh*. In fact, if there was a PhD for Schmoozability, she’d pass with flying colours. Sorry, I digress. So, here we were. I couldn’t back out now. That wouldn’t have been fair. I’d made a promise. Thankfully, we weren’t alone that day. We met some of the gang from The Legacy there. My friend Karen (the amazing and scrumptious Actionman Alex’s mummy) was also there when we arrived, so that took some of the edge off my nerves. We were then greeted by a rather friendly young man who talked us through what we’d be doing. …and subsequently, my blood pressure went a little higher! But the hours flew by. We talked to the lovely Lorna and Joel from Heart North West – I gave my interview and was absolutely, categorically, beyond rubbish (just like I said I would be)…and surprised myself by getting a bit emotional. Well, I suppose it’s to be expected; we’ve had a bit of a rough time over the past few months, haven’t we? 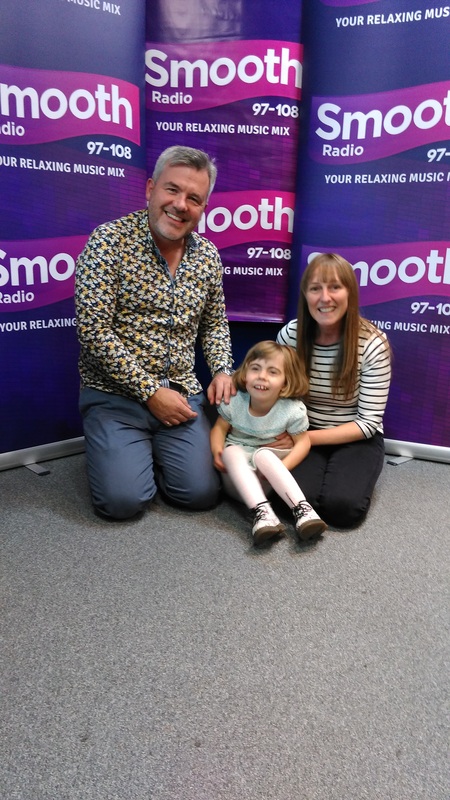 And we met and had our photo taken with the (rather yummy) Carlos from Smooth fm who was SO nice to Hannah – it’s refreshing to have people talk to her as one would do with an average child. I spoke to the lovely news man (sorry, I forget his name…so I’ll just have to call him the lovely news man) and gave yet another totally rubbish interview…I think he was just being polite when he said I’d done well….and it could be edited. We were interviewed and videoed and had our photos taken – all of which makes me cringe and want to run away and lock myself in the loo….oh, and we were also encouraged to eat the abundance of complementary toffees and cakes. So, here’s where I FINALLY, possibly, almost, get to the reason why we did what we did. If you listen to the radio, you may well have heard about Global’s Make Some Noise Charity, created by Global, who own twenty billion radio stations across the UK. Well, maybe not quite that much (a slight exaggeration there)…but a lot!…like Smooth fm, Classic fm, Heart fm, Capital fm etc etc who’re all part of the Global empire…and having 23 million listeners…I’d call that an empire, wouldn’t you? Anyway, I’m digressing about empires and, as usual, just rabbiting on without actually getting to the point. You may have also seen Hannah recently being featured on their website representing The Legacy as one of the charities they’re supporting. Yay! So there you have it. Global’s make some noise and Smooth FM North West are very kindly supporting our tiny little charity – one of many that don’t get the recognition that they justly deserve. One of many that changes lives – for both children and families alike. Our lovely, precious little charity…that now has the potential to grow and develop and be utterly fabulous and benefit lots more children, young people and adults in the future. So a handful of parents, young people and staff were all invited to the station to share their experiences and talk about what The Legacy means to them. …and we had to keep schtum about it until it was aired. Apologies to everyone who may hear me on the radio – as it appears that our recordings will be played repeatedly and for quite some time to come – in fact, as I write, I understand that, on the first day of airing, I was ‘played’ on the news, every hour, on Smooth FM this afternoon! I tried my best. But sometimes it’s incredibly difficult to put into words about Hannah, our experiences and feelings and it’s far easier somehow to put it down on a blog or a piece of paper where you can hide the emotion in your voice or take time out and come back to it when you’re feeling less sensitive or just have a weep over the keyboard, trying hard not to electrocute yourself in the process. Apologies for my stupid voice…but it’s the only one I’ve got…and I’m not putting a posh voice on for anyone. I am me. Like it or lump it. Apologies to the lovely editing people who undoubtedly will have scratched their head in dismay listening back to my gibberish and wondering how they were going to cut and paste and get even a tiny coherent sentence out of what I said. In fact, apologies to everyone actually. Hindsight’s a great thing, isn’t it?. Driving home, I reflected on what I ought to have said, but didn’t. What I wanted to say, but didn’t. There’s tons I could’ve said…like I was immensely proud of my girl and all she’s achieved so far…indebted to The Legacy for what they’ve done for Hannah so far…overwhelmed with everyone’s support for the charity… oh, I could go on…now! But it’s too late now. Did I listen to Smooth FM previously? Oh, yes. Did I like listening to Carlos’s rather delicious and hypnotic voice during drivetime…oh yes!. Have I got a teensy tiny bit of a crush on him now that I’ve met him….erm…well, promise you won’t tell Hannah’s daddy? No? OK then…YES!!!!!!!!!! Well, c’mon, it’d be incredibly rude not to, wouldn’t it? So, let’s wrap this up shall we? Thank you doesn’t seem to hit the mark really for Global and Smooth FM’s support of The Legacy, nor does thank you feel enough for the amazing efforts of thousands of people all across the country who do all kinds of amazing and sometimes utterly bonkers things, just to support little charities like The Legacy…who in turn, help Hannah and kids (and adults) just like her to achieve their potential. However, all I can say is thank you, thank you and a million times thank you from Hannah and also from me – her mummy, who’s immensely proud of all that she’s achieved so far and hopeful for what she can achieve in the future. So, that’s all for now, my lovelies. Apologies for the lengthy post. I perhaps could’ve just said – Hannah and I went to the radio station, I talked, she schmoozed, we had a good time, Global are supporting The Legacy. Great news. Happy bunnies. I couldn’t tell you, so I had to keep it a secret, but it’s not a secret anymore. The End. A nice day was had by all. Including me and it was something nice to take my mind off the utterly horrid stuff that’s happened recently. I’m just a bit sad that I couldn’t tell my mum about it. But hey, that’s life, huh? …and finally, another additional happy ending to this story, is that I didn’t throw up on a famous person. This entry was posted in Miscellaneous, Therapy and tagged Child, Cornelia de Lange Syndrome, Education, Mummy blog, Parenting, special needs, The Legacy Rainbow House. Bookmark the permalink. 6 Responses to The secret’s out!